With summer being the season of love and romance, it is a popular time for weddings and proposals! If you’ve recently popped the big question or have a wedding on the horizon, this is your perfect menswear wedding style guide for grooms and groomsmen. Whether you are planning a laid-back beach wedding, a suave garden party soiree or a formal evening reception, Rundle Tailoring is the place to go for the best quality wedding suits, blazers, morning tails or black tie. Our expert team will help you find the perfect style and fit to suit your wedding day dress code, ensuring you look your best on the day (and for evermore). 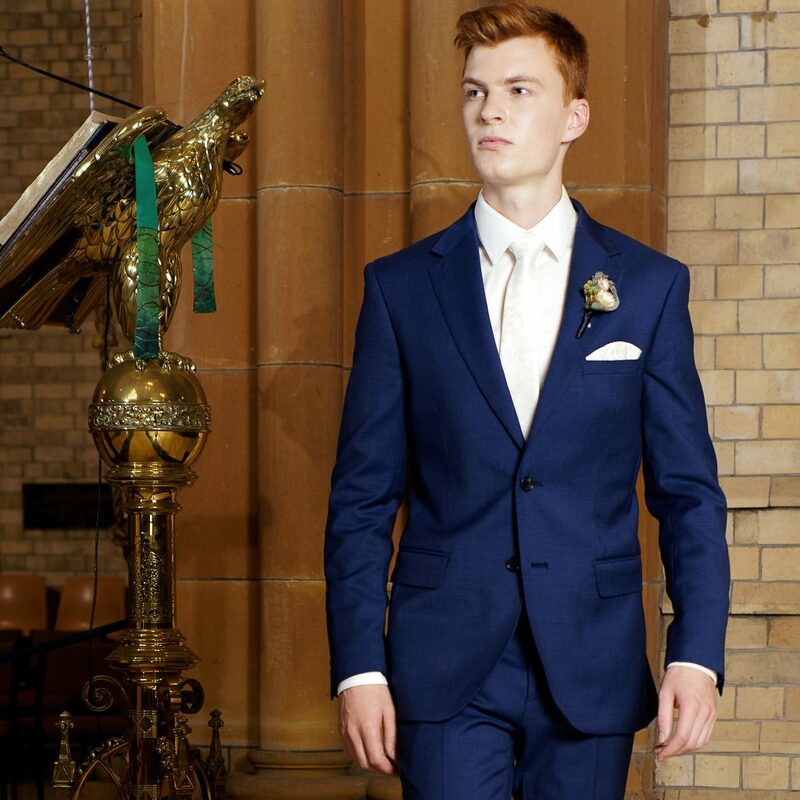 We have a large range of wedding suits available at different price points to suit all budgets. We also have a great range of colours, styles and sizes. 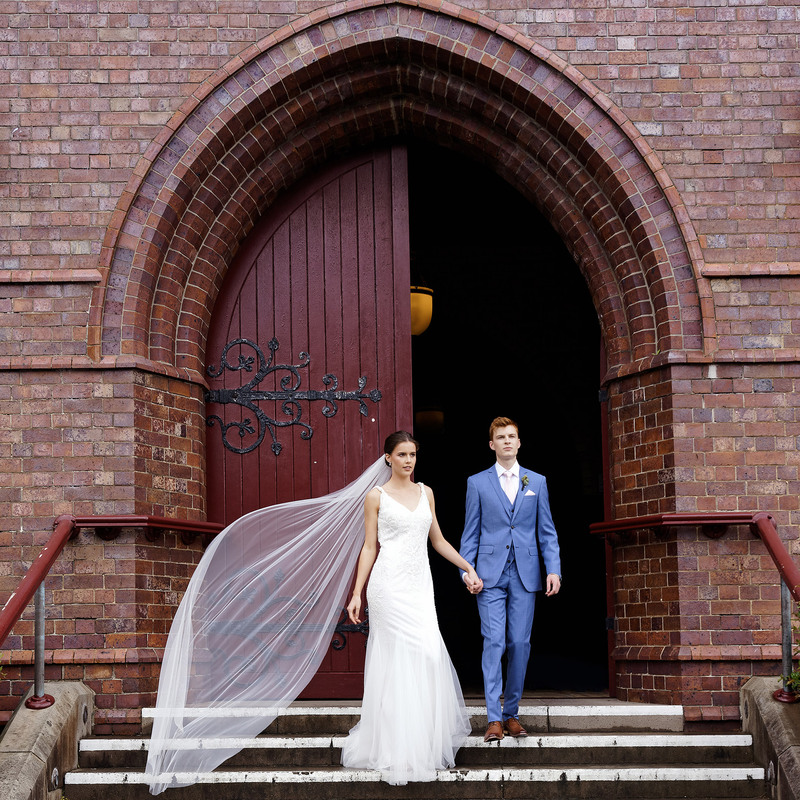 Take a look behind the scenes on our recent styles shoot at the beautiful Christ Church Cathedral in Newcastle. 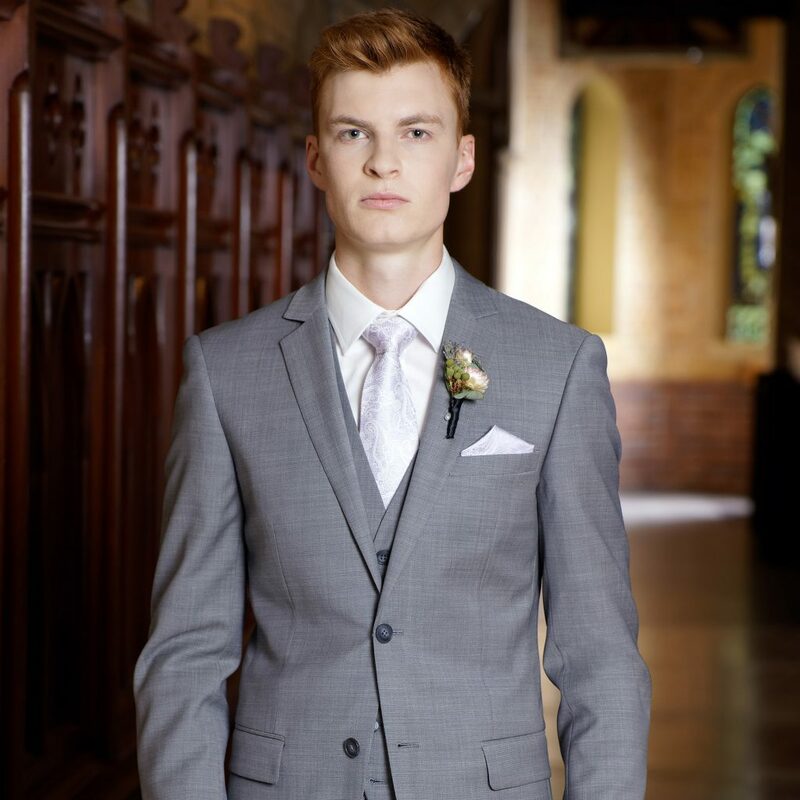 Garden Party weddings are popular in the warmer months and with our close proximity to the Hunter Valley we see a lot of grooms opting for this semi-formal style of attire. Many stylish grooms are now choosing to wear chinos with a sports coat or blazer and a patterned shirt and bow tie. A garden party or beach wedding will typically stipulate a semi-formal dress code on their wedding invitation. Rory is wearing New England Regal Jacket, Wolf Kanat Topsky Grey Chinos, Geoffrey Beene white shirt, James Harper mini floral bow tie, textured black and navy pocket square, Florsheim Dalton shoes and Buckle belt. Living on the coast, a lot of our brides and grooms have a close affinity with the sea. Beachside ceremonies and receptions are particularly romantic, with the ocean setting a perfect backdrop to your day. Beach weddings are also typically more casual. 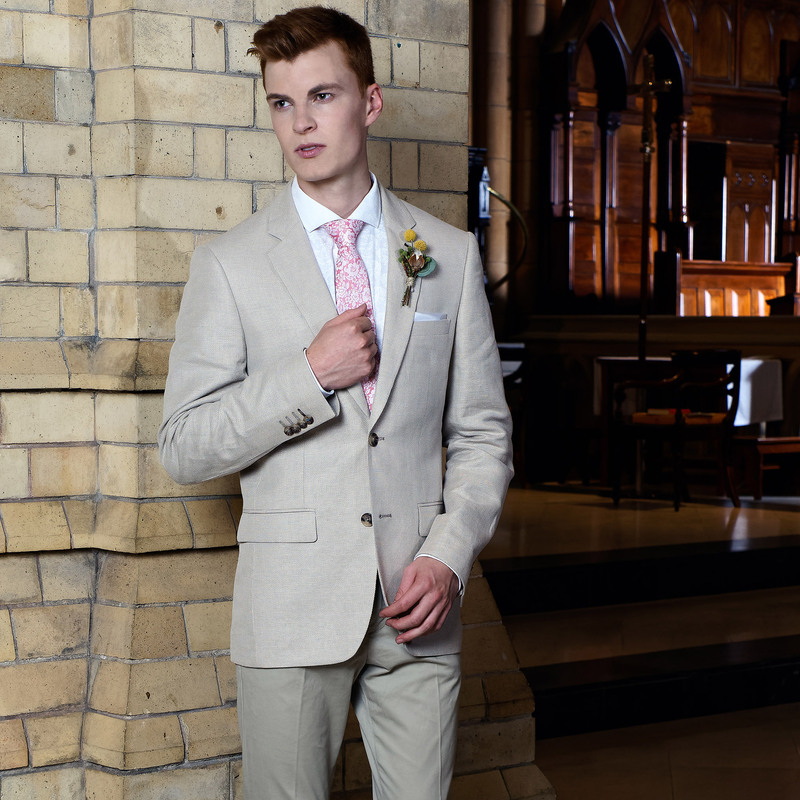 We recommend a softer shade such as this cream sportscoat and chinos with a pink tie and pocket square. 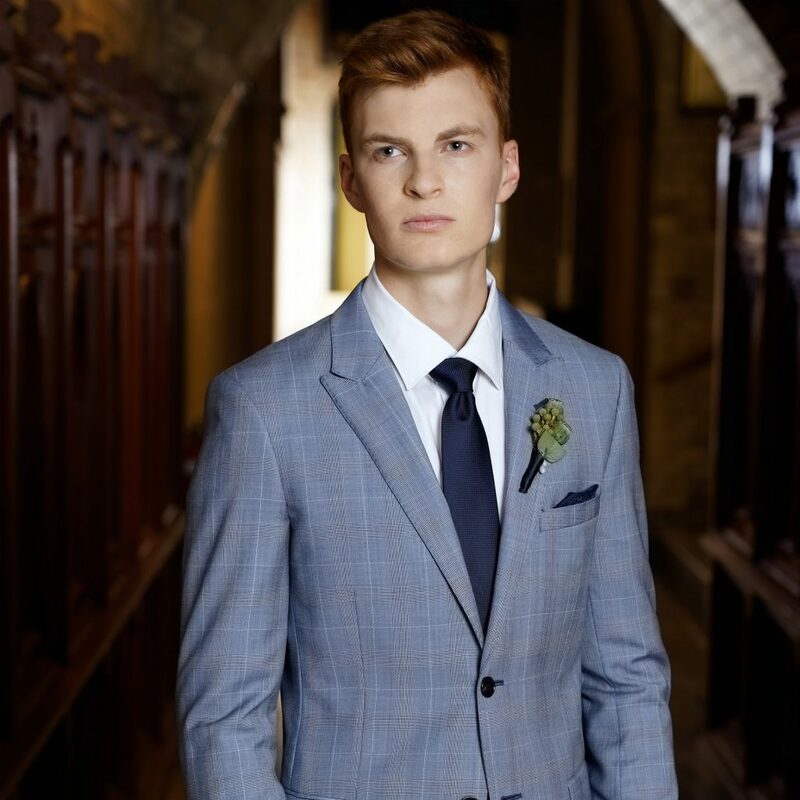 We also have linen suits in store, which is a popular choice and a great suit to wear to summer weddings, as it’s a natural fibre that breathes, meaning you stay cool and comfortable. Rory is wearing Brooksfield Sand Jacket, New England Earl Chino, James Harper High Tiger Print white shirt, James Harper tie and pocket square, Ferracini shoes and Buckle belt. Formal and Cocktail are our most popular weddings. 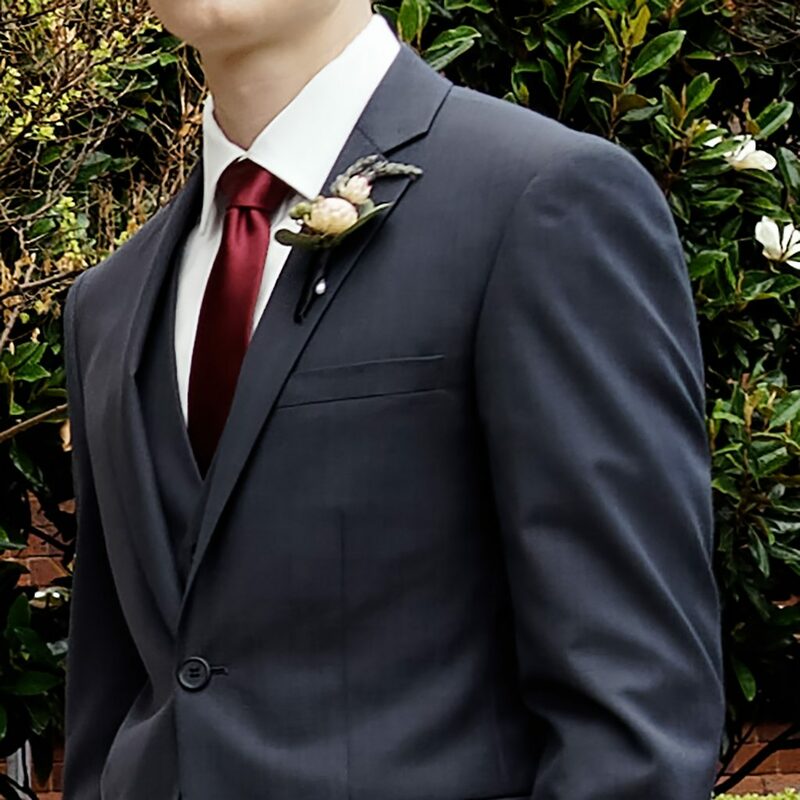 A formal dress code is usually a two or three-piece suit with a tie, where as cocktail can be a little more casual or edgy, such as a sports coat and trousers or a suit without a tie. Formal or cocktail weddings are typically evening weddings, however are not as formal as a black tie dress code. 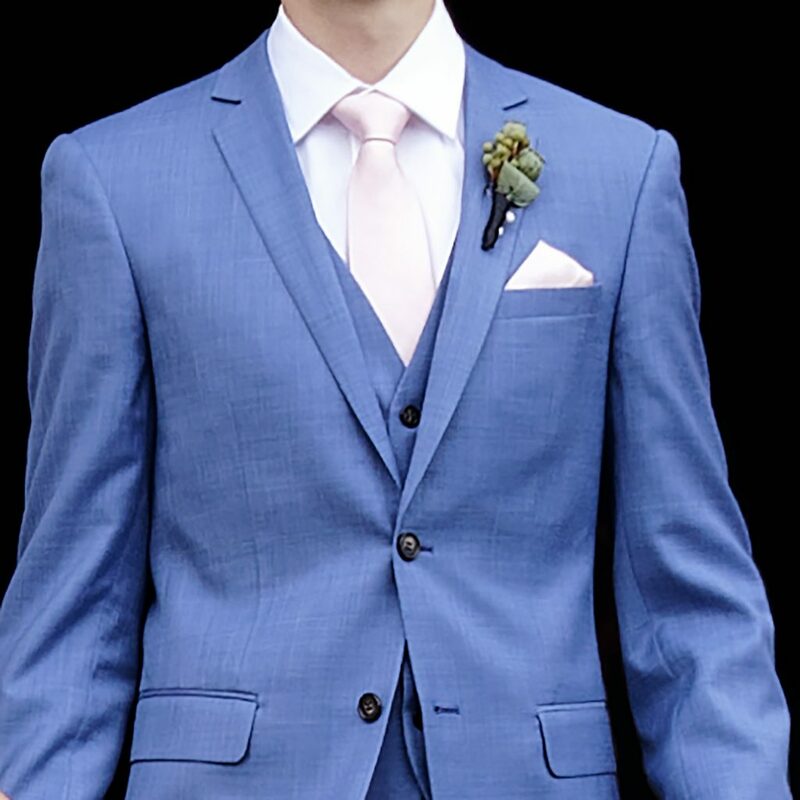 Grooms can choose from an array of colours for their formal wedding suit, including black, blue or grey, however darker hues are typically more classically formal and are perfect for a church ceremony. Rory is wearing New England Jet Char 3 piece suit, Brooksfield cream shirt, Collezione Burgundy tie, Florsheim Dalton shoes and Buckle belt. The New England Jet Char suit is 80 per cent wool. It’s a great fitting suit for many shapes and sizes and is a good value suit for a wedding party. It’s available in five different colours including navy, aqua, mid-blue and black. Rory is wearing the slim fit Wolf Kanat Lenningrad Navy Suit, normally $599 now $429 with a Geoffrey Beene white shirt, Carlo Visconti tie, Florshiem Dalton shoes and Buckle belt. This is a classic wedding style that will have you looking sharp on your wedding day. Cocktail weddings are still formal but by stipulating cocktail you are giving guests (and yourself) the licence to have a little more fun. Often a cocktail dress code will be a little bit more contemporary and don’t necessarily require a tie. Accessorise with a floral lapel pin and pocket square or add your own personality by wearing a checked suit. Rory is wearing the latest release Studio Italia Bravo Blue Suit, Brooksfield cream shirt, Collezione Ivory Anzio tie and pocket square, Ferracini shoes and Buckle belt. This suit is available in three other colours including charcoal, navy and grey. Rory is wearing New England Code Titanium 3 piece suit, Brookefield cream shirt, Medici silk tie and pocket square, Florshiem Dalton shoes and Buckle belt. It is available in five other colours including blue, navy, grey, charcoal and black. Incorporating 3 per cent lycra into the fabric, this suit has a bit of stretch, giving it a relaxed feel. Rory is wearing Studio Italia Icon Black Suit, Brooksfield shirt, Carlo Visconti tie, Geoffrey Beene cufflinks and tie bar. This is our most popular suit for weddings. It comes in six different colours and can be worn as a two or a three-piece suit. Rory is wearing New England Midblue Penn Suit, Geoffrey Beene white shirt, Carlo Visconti tie, white pocket square, Ferracini shoes and Buckle belt. This is a great looking suit for $249 (wedding party special) as a two-piece and also comes as a three-piece suit. Popular for large wedding parties. Rory is wearing Studio Italia check The Ruben Suit, Geoffrey Beene white shirt, Carlo Visconti navy textured tie, Navy pocket square and Florshiem Dalton black shoes and Buckle belt black. Black tie is a formal evening event or party that takes place after 7pm. A black tie suit is different to a suit worn for business or daywear as it usually has satin on the lapels of the jacket and as an option can have a satin stripe on the trousers. Black tie weddings typically require a dinner suit to be worn. Rory is wearing Joe Black peak lapel Sloane Suit, Abelard Marcella white stud shirt, Collezione bowtie, Geoffrey Beene cufflinks and tie bar, Florsheim Dalton shoes and Buckle belt. A peak lapel dinner suit is typically more high fashion. 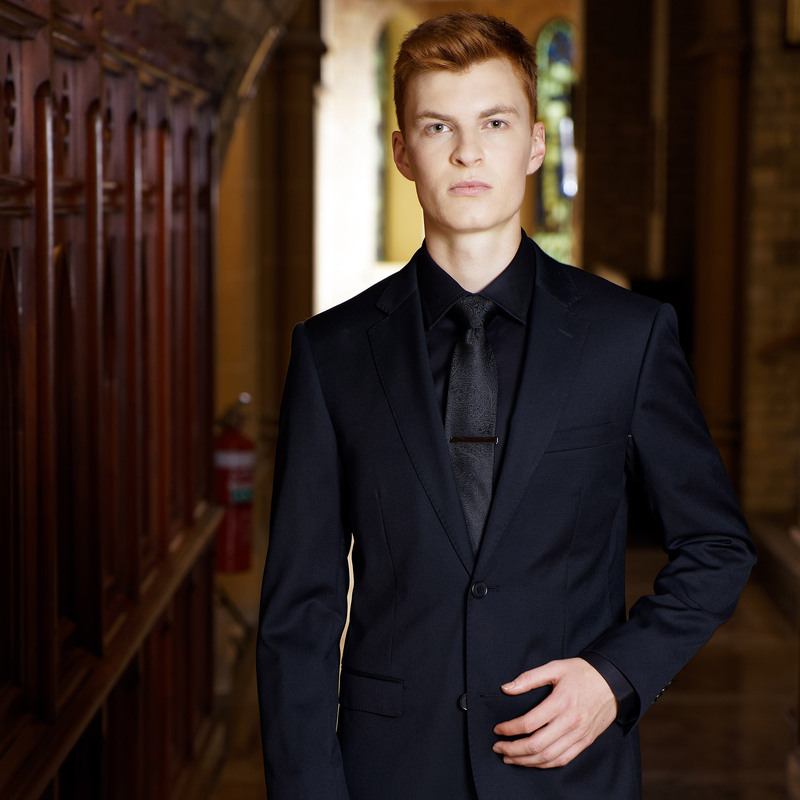 For a more classic look consider the shawl lapel Studio Italia dinner suit that we have in stock. 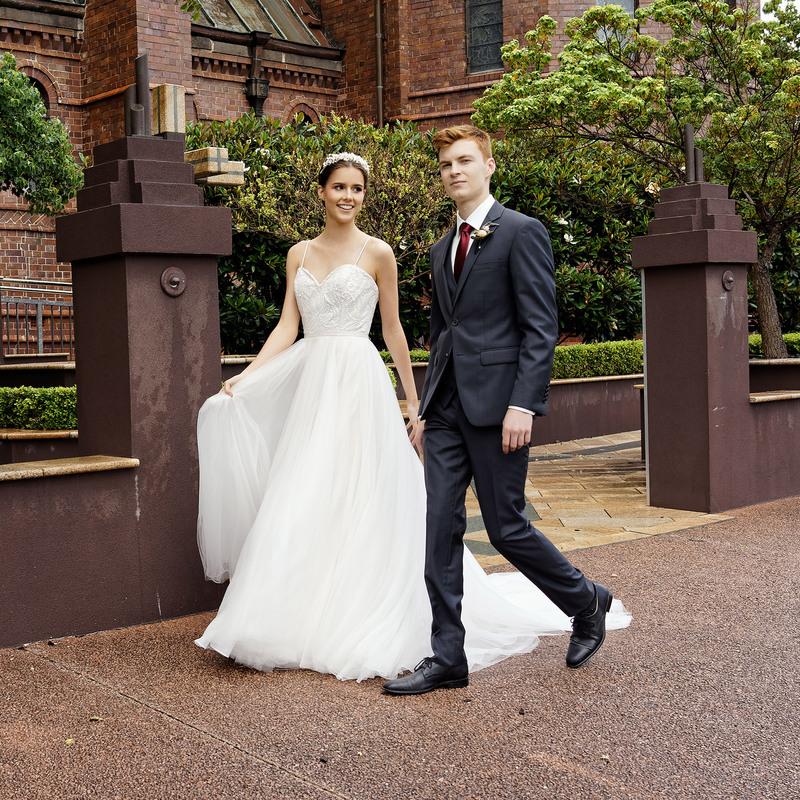 For more information on dressing for your big day click here. We stock a full range of ready to wear suits and also have a large selection of hire suits available in store. If you can’t find what you are looking for or are looking for a unique custom-made suit talk to us about our special made to measure offering. 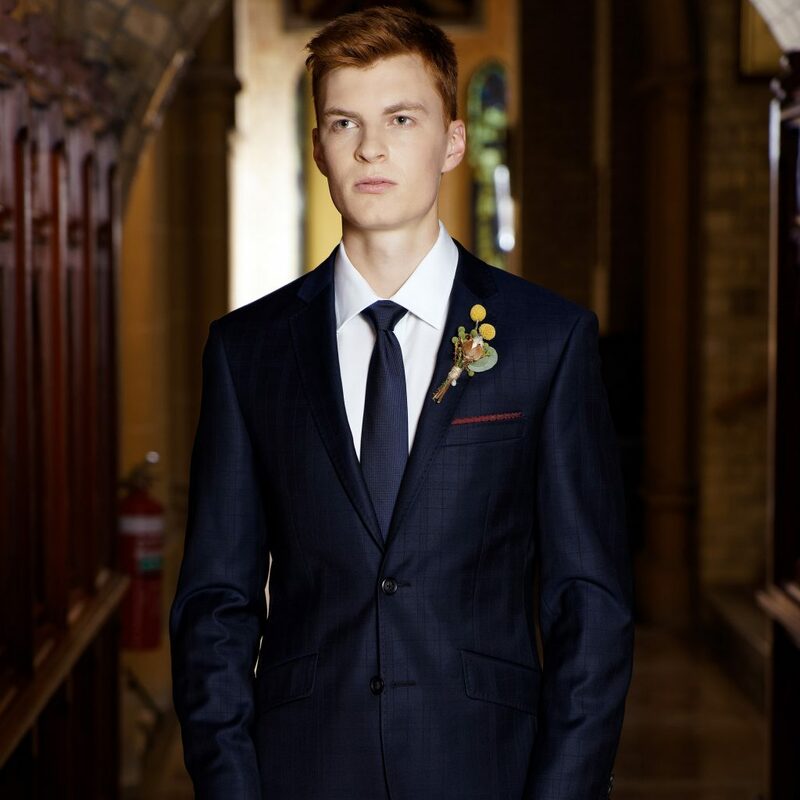 For more information about how we could help you put together your ultimate wedding outfit book an appointment online here or phone to book your consultation with our wedding suit experts.